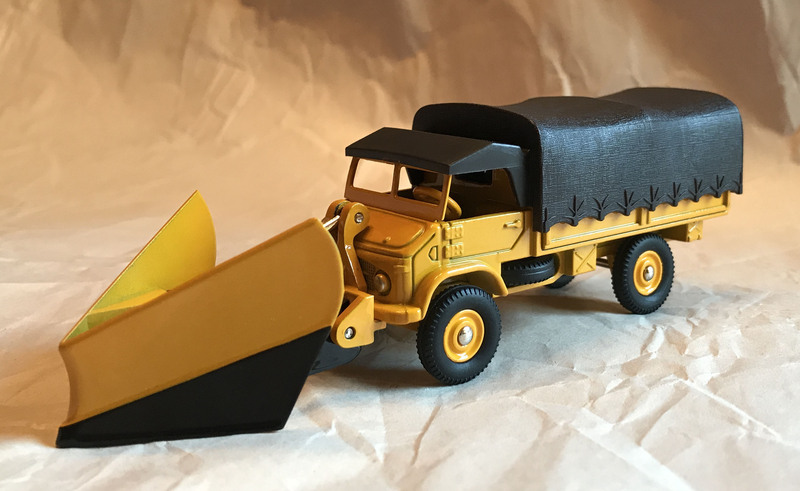 Tinplate Mercedes-Benz UNIMOG Type U411. 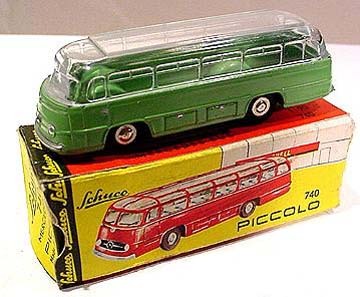 Made in Germany by Tipp & Co. a.k.a. TCO (Tipp & Co.) or Tippco. 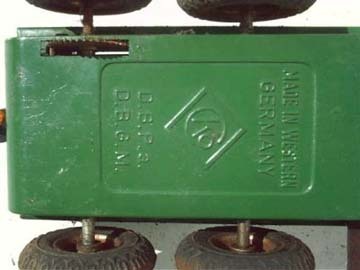 Note the original packaging, and location for the key – just ahead of the rear wheel. 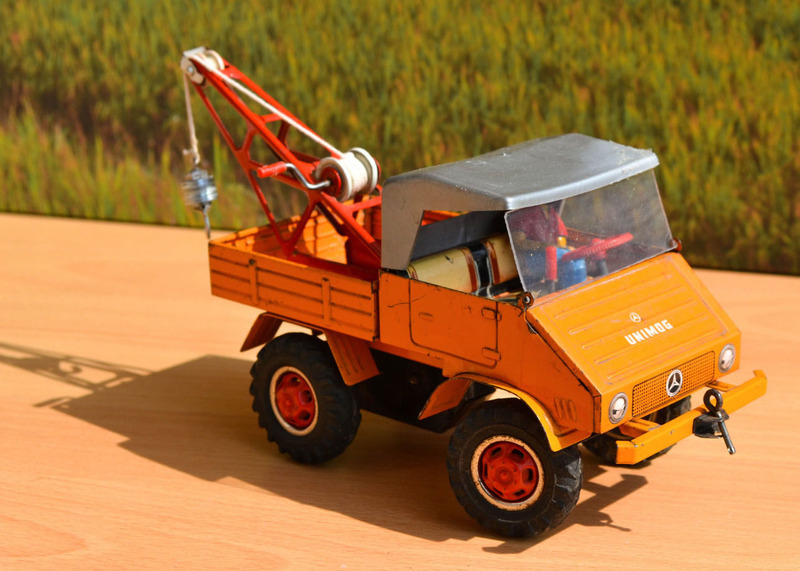 For more on the history and development of the Mercedes-Benz UNIMOG, visit the UNIMOG Overview (1953-1962) page. 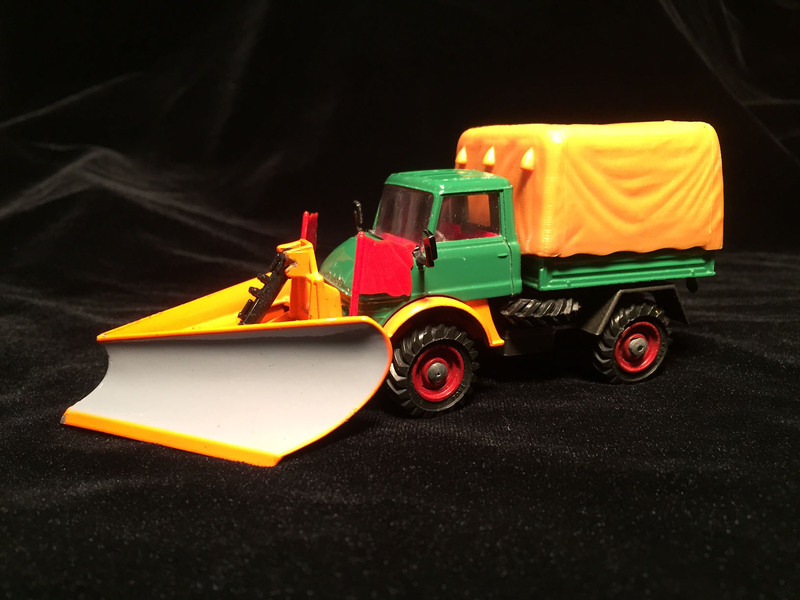 Tipping Lorry - orange, red hubs, removable plastic cab roof, clear plastic fold-down windscreen, levers in cab operate motor and tipping mechanism, hinged rear tailboard, with key. 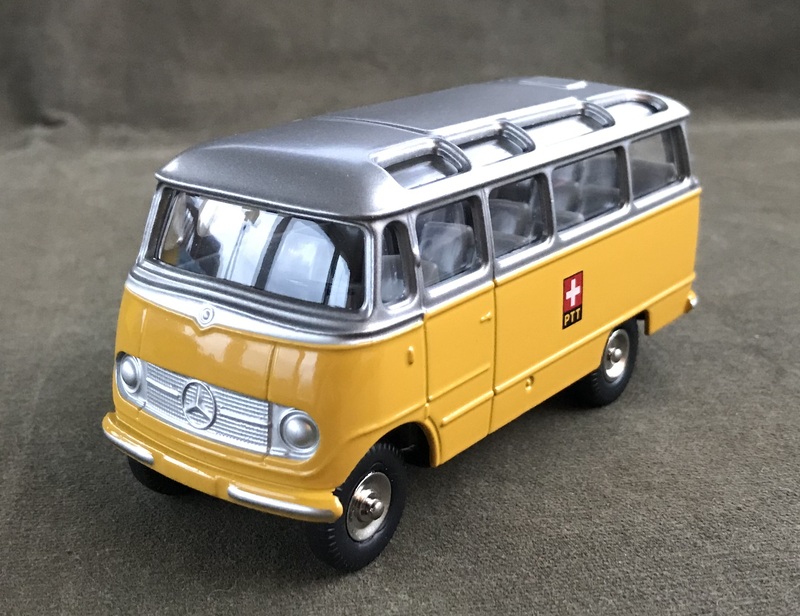 Approximately 50 mm long (2 inches), this is the 1:90 scale Schuco (Germany) "Piccolo" series solid die-cast Mercedes-Benz UNIMOG Type 401. These models can be found (brand new with box) at flea markets and in catalogs for about $10-$15 (circa 2005). On-line auction prices are typically more expensive. 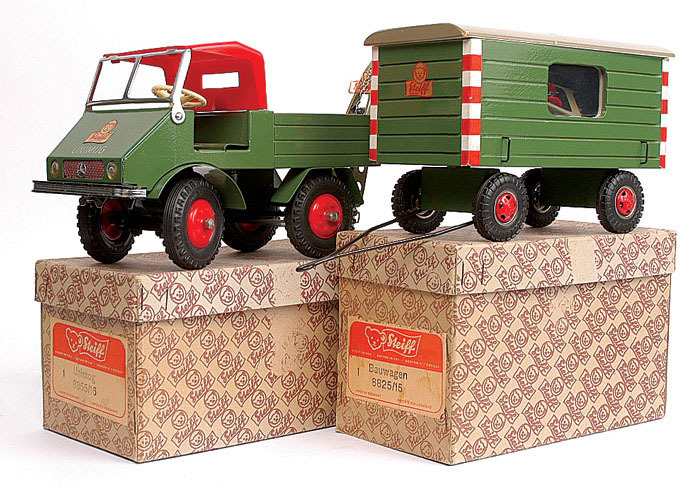 Pressed steel/wood vehicles. 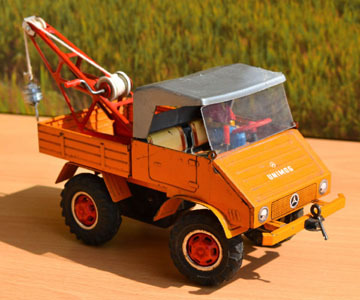 UNIMOG has pressed steel cab, wooden body, red plastic tilt and hubs, red painted body interior, steerable front wheels, aluminium folding windscreen. 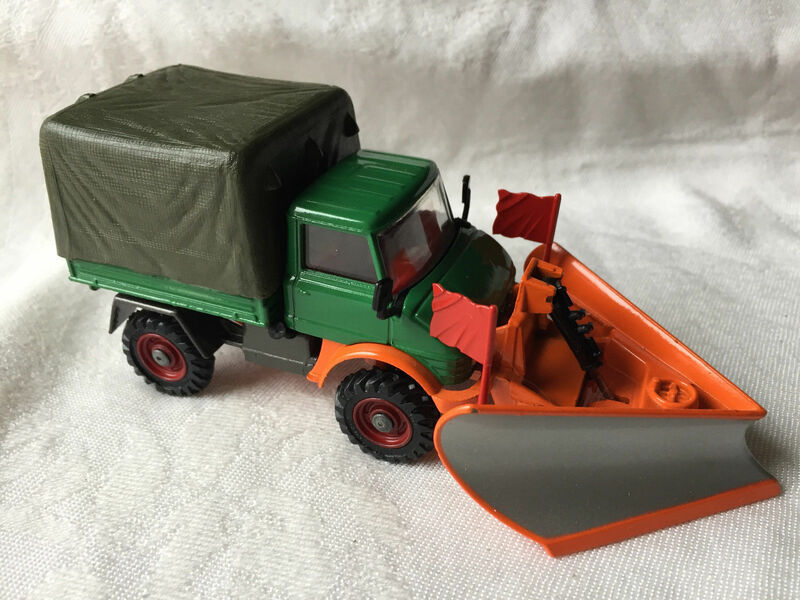 Matching wooden trailer is green, with red/white corners, grey roof, red hubs, removable roof to reveal interior, which includes items from UNIMOG Accessory Set including 2 x pressed steel jibs, wooden steps, spanners etc. 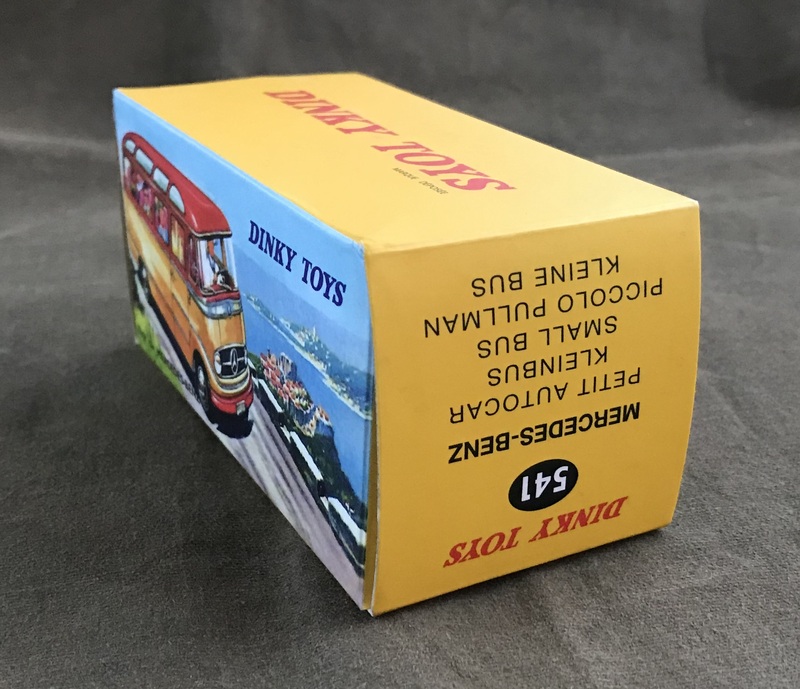 Card boxes with lift off lids. Dinky (France) № 821. Originally released in 1960. 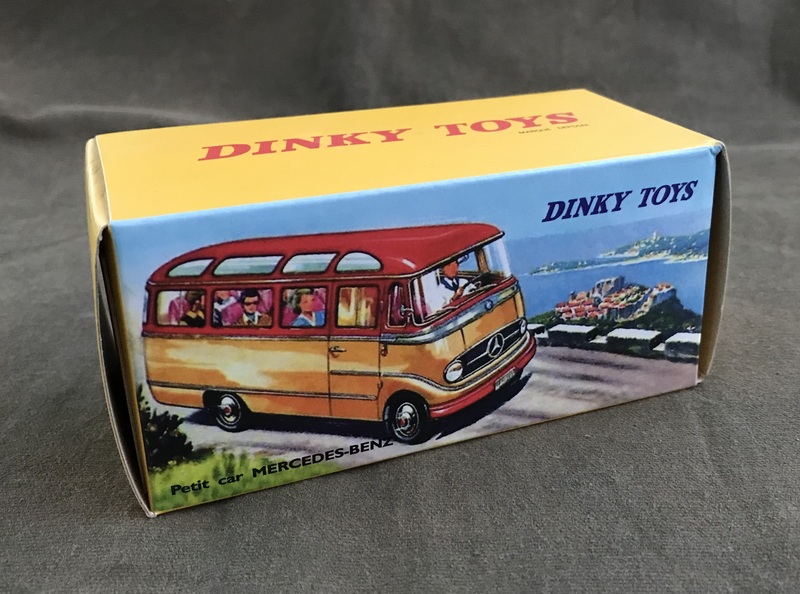 Re-numbered and re-released as 804 in 1973 by Dinky. 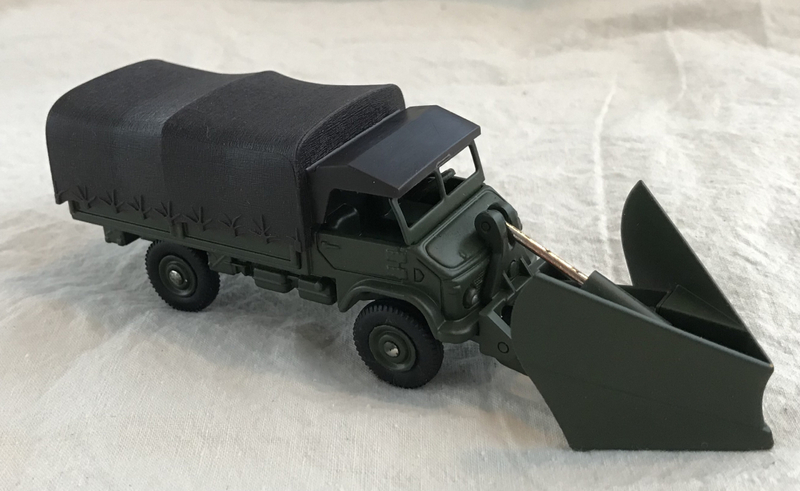 This is a 1:43 scale die-cast replica of the Mercedes-Benz UNIMOG Type 404S troop carrier, which was used by the Swiss Army. 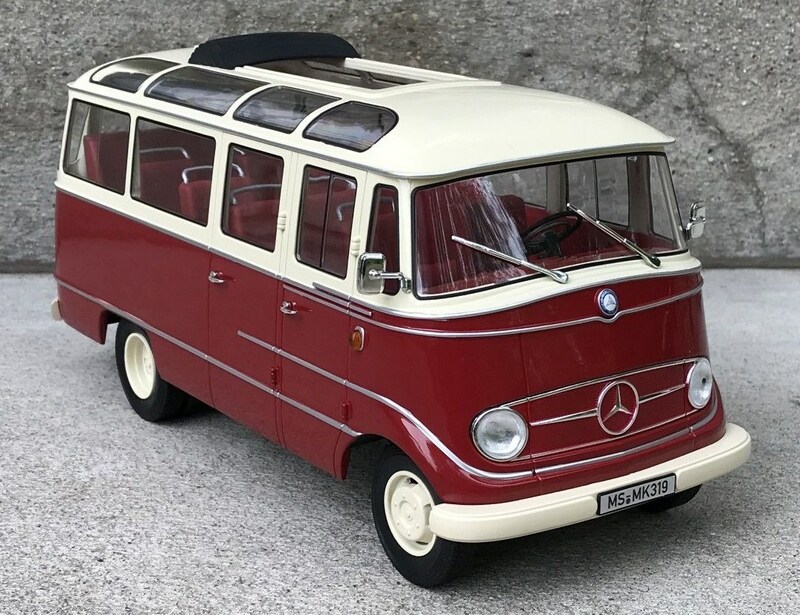 The full scale Type 404S was a Ponton era vehicle made by Daimler-Benz at their truck manufacturing plant in Gaggenau, Germany from 1956 to 1980. 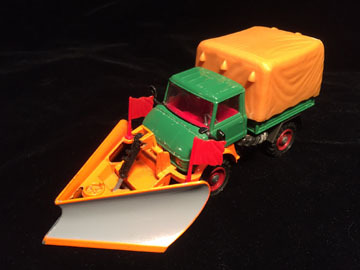 Baseplate of 821 (back to front): "Meccano France / Mercedes UNIMOG" or "Dinky Toys / Mercedes-Benz UNIMOG / Meccano France"
Baseplate of 804 (front to back): "Meccano / Dinky Toys / 804 / Mercedes tous terrains / Made in France"
The list is not all-encompassing. Additional data will be posted as available. 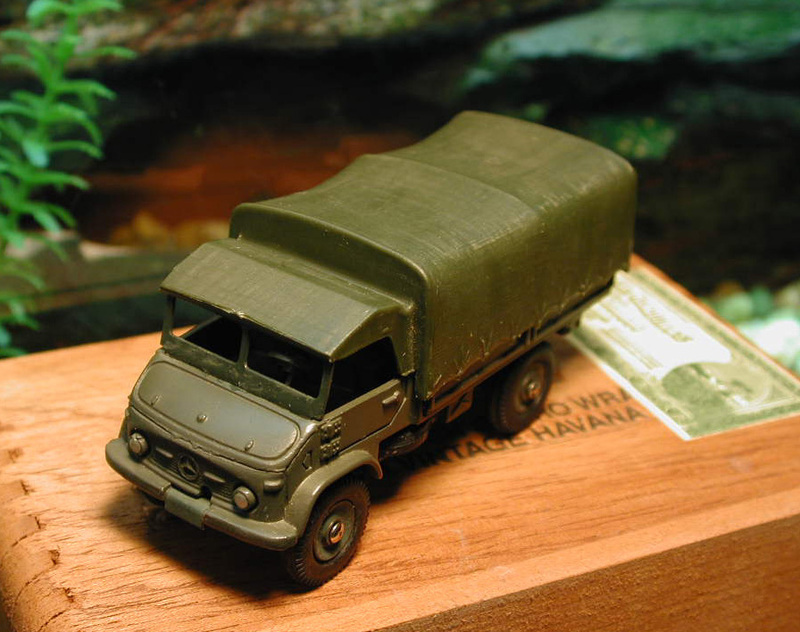 The reason for taking the photo was the non-camouflage box was a new addition to The Closeum. 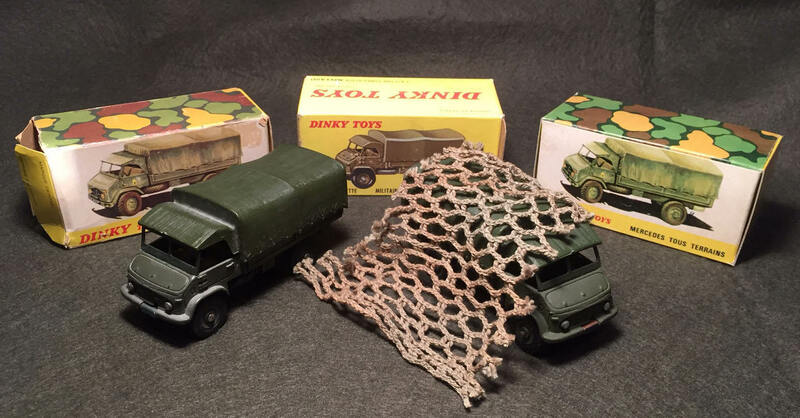 The UNIMOG with the netting (goes with box at far left) was procured at the York, Pennsylvania toy show November 30, 2014. Didn't realize how dusty the 'Mog on the left was until seeing the photo. 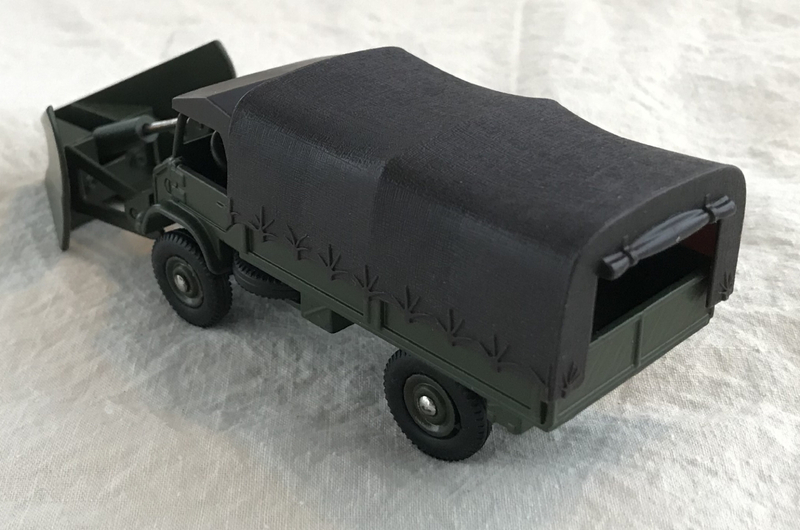 The quest then shifted to developing a win-the-future strategy by engineering a right-sized framework to spearhead a data-driven integration of a pre-1973 "821" example to successfully fill the empty, non-camouflage box. 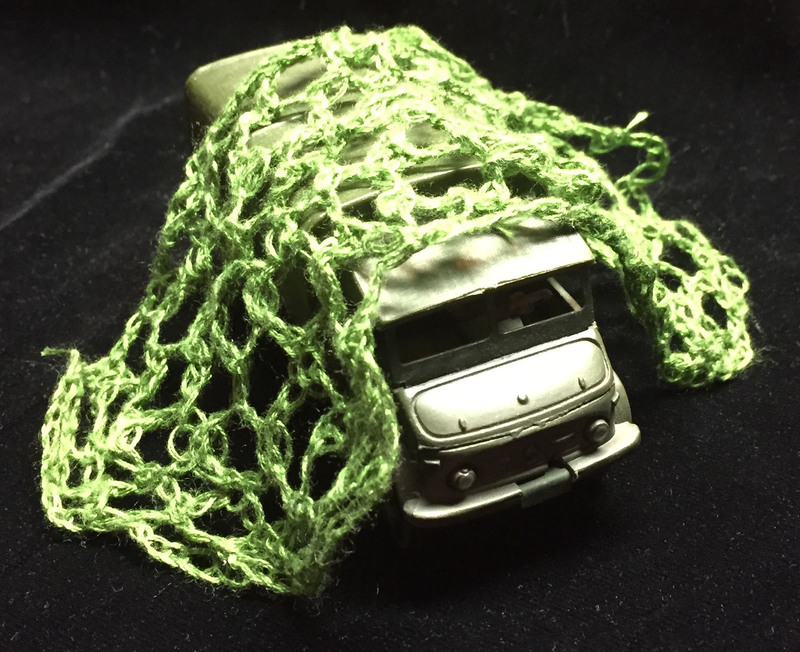 Home-made camouflage net. This project took longer than expected due to delays sourcing a suitable size thread to fit inside the back of the carrier. This was the second attempt. The first thread was too bulky, and would not compress small enough. 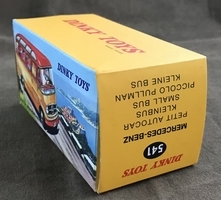 Pontonobilia Detectives: There were several variations in the packaging. This French-made Dinky Toys model was originally released in 1967. The black canopy on this example is a reproduction. Tires may not be original (compare with the spare underneath). 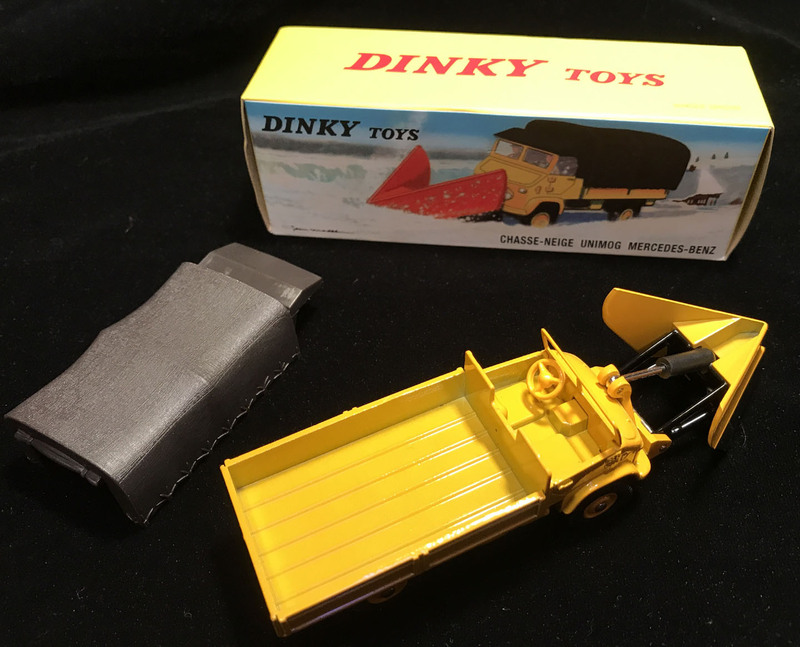 The reproduction is faithful to the original, including the box. Notice the width of the rear axle on the Atlas reproduction. The rear axle of the Atlas reproduction is not as wide as the original French-made example. Overall, I have been quite pleased with the quality of the Atlas reproductions, but noticed something about the base of this model. The rear axle is not as wide as the original. Notice the original had a type of spacer built into the casting, which forced the rear axle to be wider. That spacer is absent on the reproduction. Fortunately, it does not visually detract when displayed on the shelf – you'll agree. This Chinese-made reproduction features a custom, military style olive drab paint job. Notice the green canopy. The original, French-made Dinky 567 came with a black canopy. 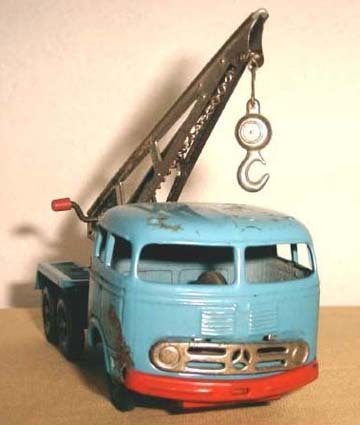 Ironically, this eBay custom job originated in France. 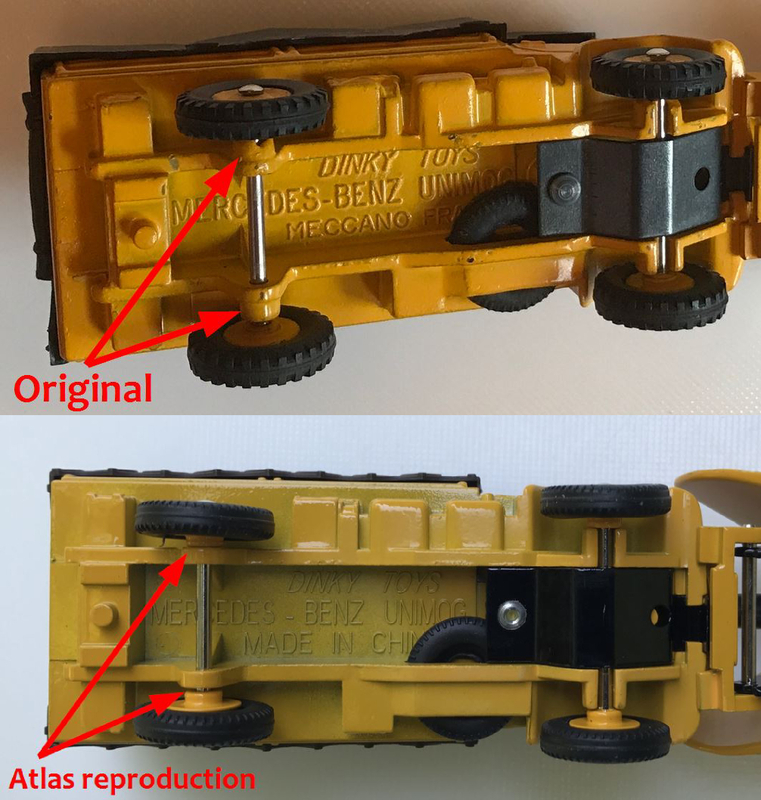 Once again, note the rear axle of the Atlas reproduction is not as wide as the original French-made example. 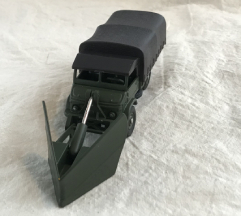 Ponton era LKW (Lastkraftwagen = truck) made by Kellerman (Germany). 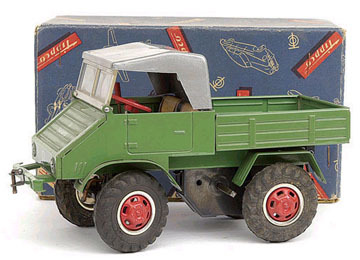 This model represents one of the many LP-series LKWs that were made by Daimler-Benz during the 1953-1962 time-frame. Kellerman was founded in Nuremberg in 1910 and went out of business in 1979. Kellerman is sometimes referred to by the name, "CKO" or "CKO Toys" because of their trade mark logo. The Kellerman "CKO" trade mark logo is embossed on the base plate. Also note the "D.B.G.M." (Deutsches Bundes Gebrauchs). 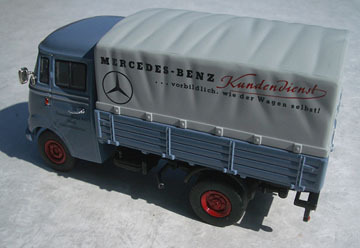 Kellerman (Germany) tinplate Mercedes-Benz "LKW" (truck) made in the 1950s. This one suffers from what appears to be normal wear and tear. The truck is in "played with" condition, and so it should be — originally, these toys were never bought as investments, they were given to young lads to enjoy! 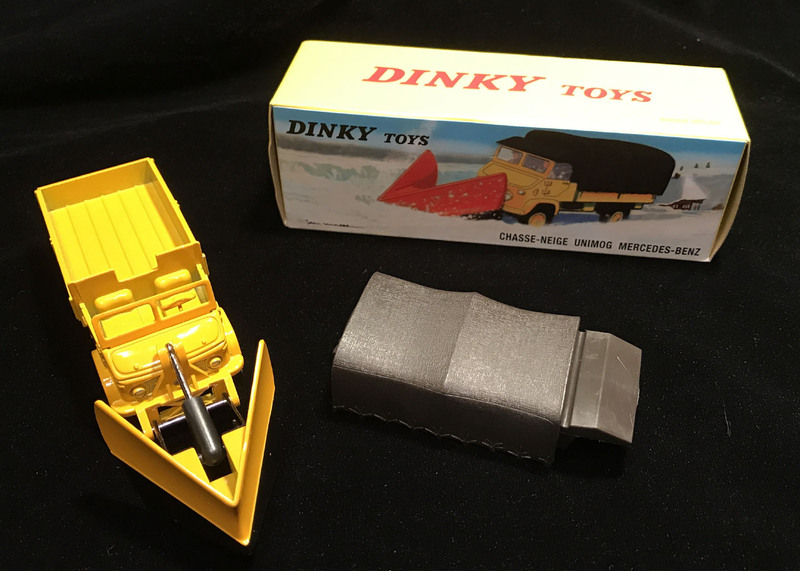 Maybe this toy helped launch a career in construction, engineering, mechanical repair, or even toy design. One thing is for sure. 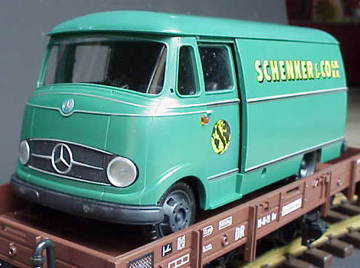 This model will get you hooked on Mercedes-Benz trucks. 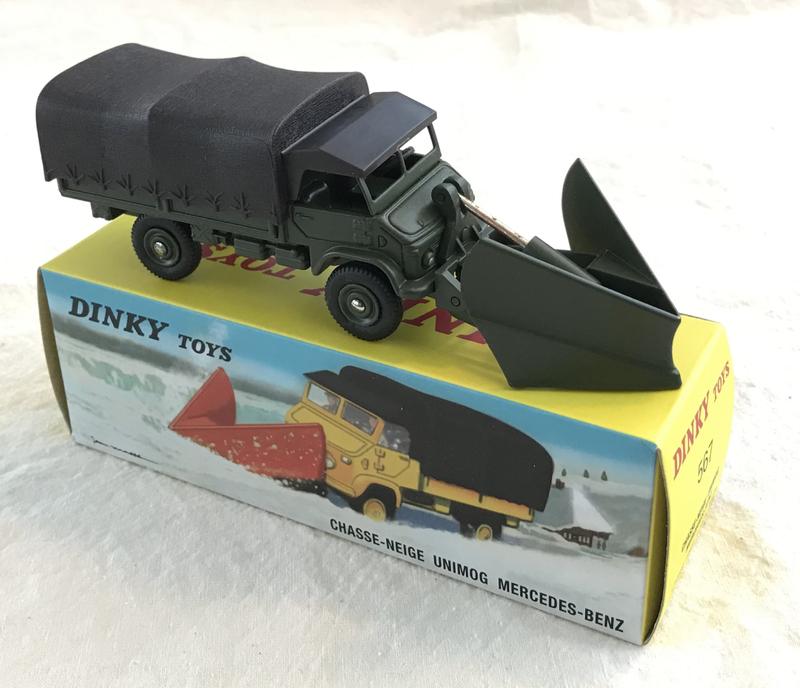 Based on the photo, I originally thought this model was perhaps 1:18 scale, but I saw the real thing for sale in Macungie, Pennsylvania on August 6, 2005 and it was much smaller. In actual fact, it was about 1:43 scale. Kellerman model number 410. 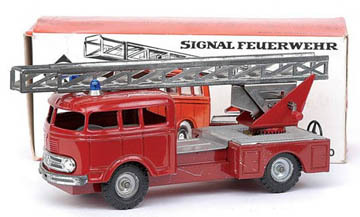 Mercedes-Benz fire truck with rotating extension ladder. Red, with plated decking, extension ladder, and friction drive. 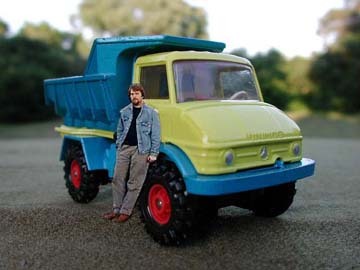 Approximately 1:43 scale. 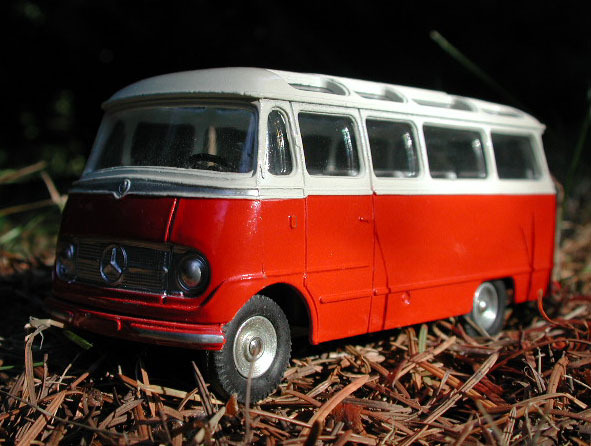 Kellerman model number 381 – Mercedes-Benz Coach. Mint condition with original packaging. 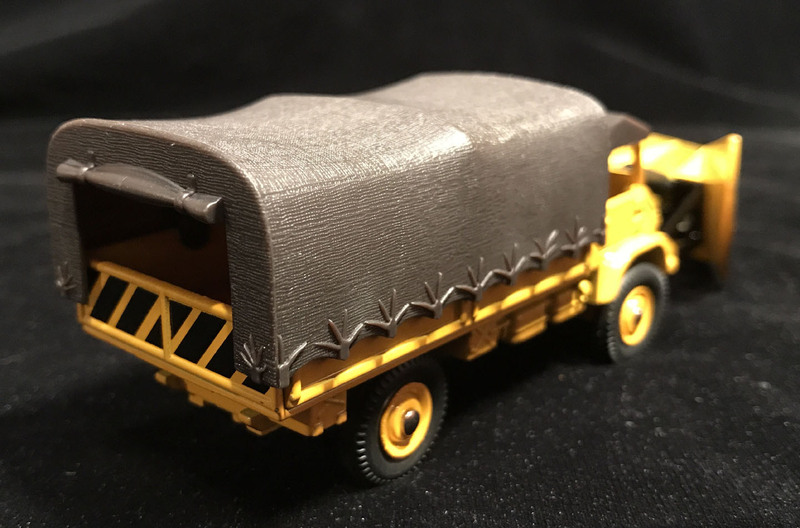 As previously mentioned on this page, a model such as this can be worth quite a bit when the scarcity is factored into the equation. This model has a lot going for it. Note the Kellerman trade mark "CKO" logo on the end of the box. This is obviously not a Ponton model, but it is a passenger vehicle made by Mercedes-Benz during the Ponton era. 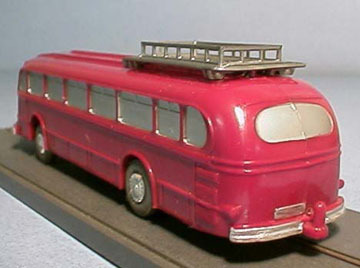 This is a Bandai (Japan) tinplate model of the Type O319 bus. 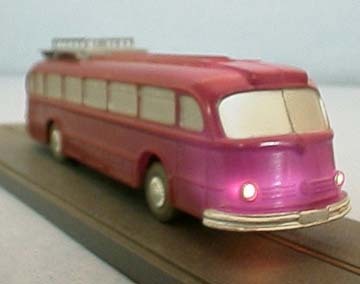 Model number 720 in the Bandai tinplate series. The O is for Oël Motor (diesel). 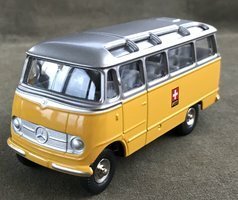 Roughly 1:18 scale. This view accentuates the sliding sunroof made for the passengers on their journey to...Lilliput, perhaps. 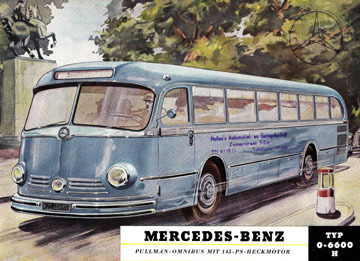 The first Type O319 minibus was presented by Daimler-Benz in 1956. 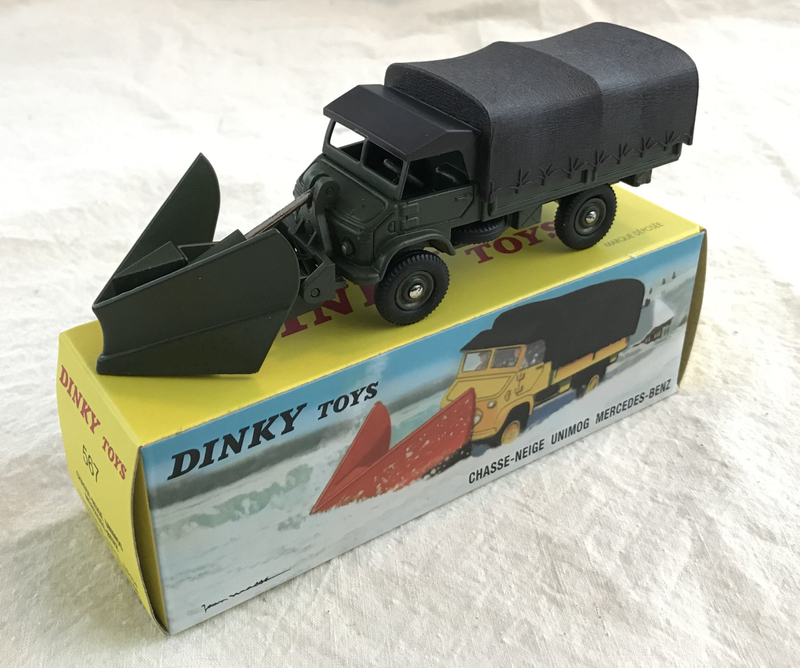 Dinky № 541 (1:43 scale) was released in 1963. 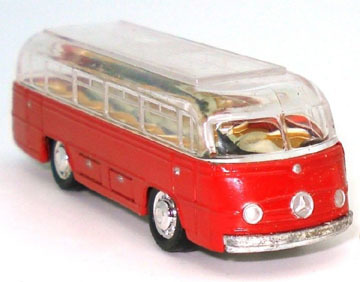 Made in France by Meccano until 1971*, and modeled after the Mercedes-Benz Type 319 utility van and passenger bus. The real Type 319 was made from 1956 until 1968, which includes it in the Ponton era. 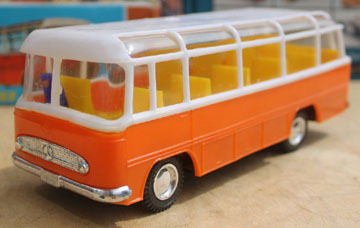 The "Omnibus" window configuration of this mini bus indicates the primary function was to carry passengers. 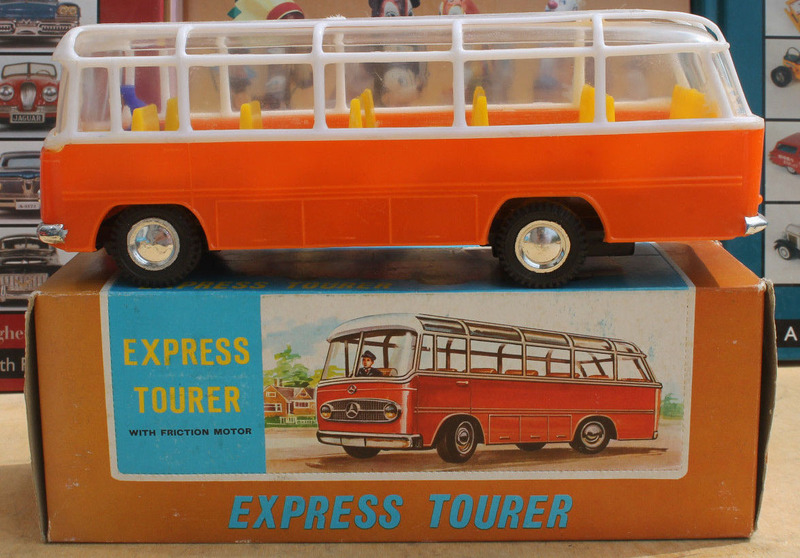 They were common as airport shuttles at the time. 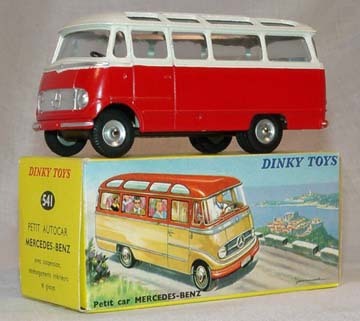 This Dinky includes a suspension, glazing (windows) and interior fittings. 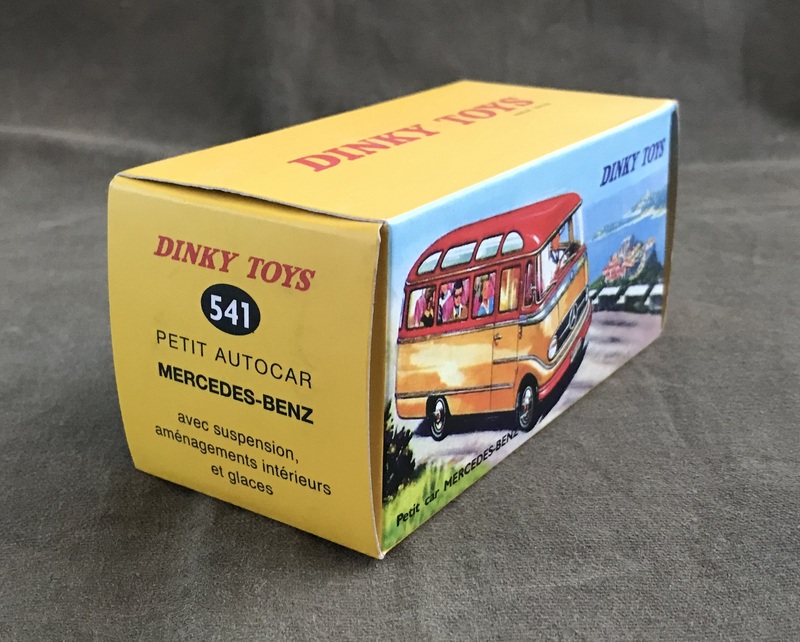 Dinky (Meccano / France) № 541 with the original box. 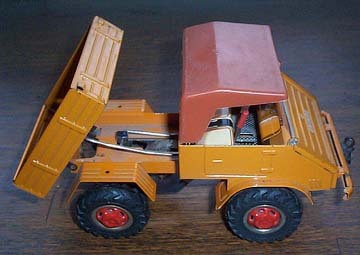 Note the dual rear wheels. 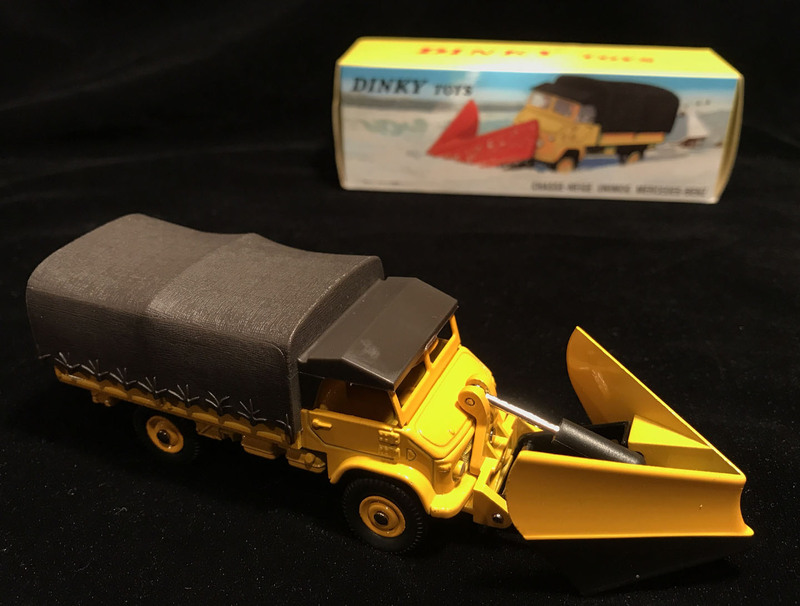 Value increases substantially when a model is in mint condition and includes the original packaging. 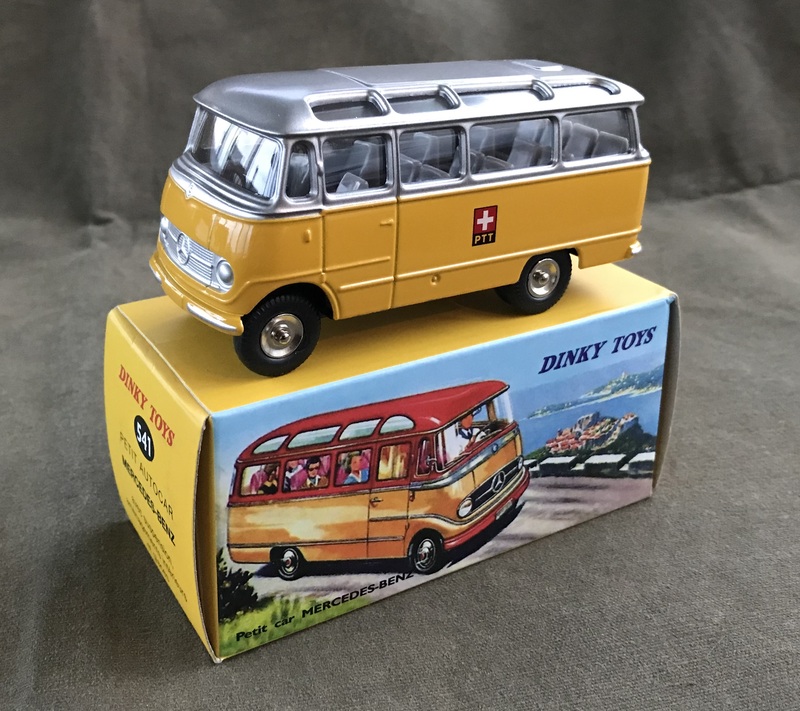 Atlas (Mattel / China) reproduction of Dinky 541 in the Swiss PTT livery. Original, French-made examples are extremely rare. 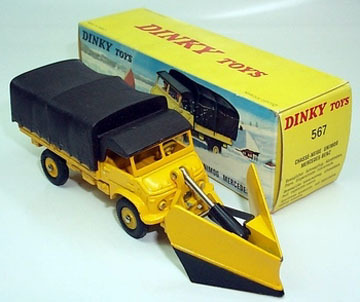 Allegedly, Dinky produced this variation around 1966 for the South African market (Ramsay's), but only three are known to exist (www.hobbydb.com). 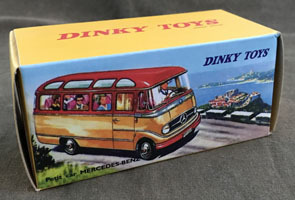 The box art features a yellow vehicle, which looks closer to the Swiss PTT variant than the more common red body and cream roof. 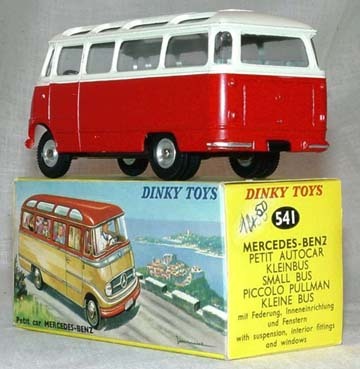 Was the French-made Dinky 541 actually ever produced in the Swiss PTT livery? 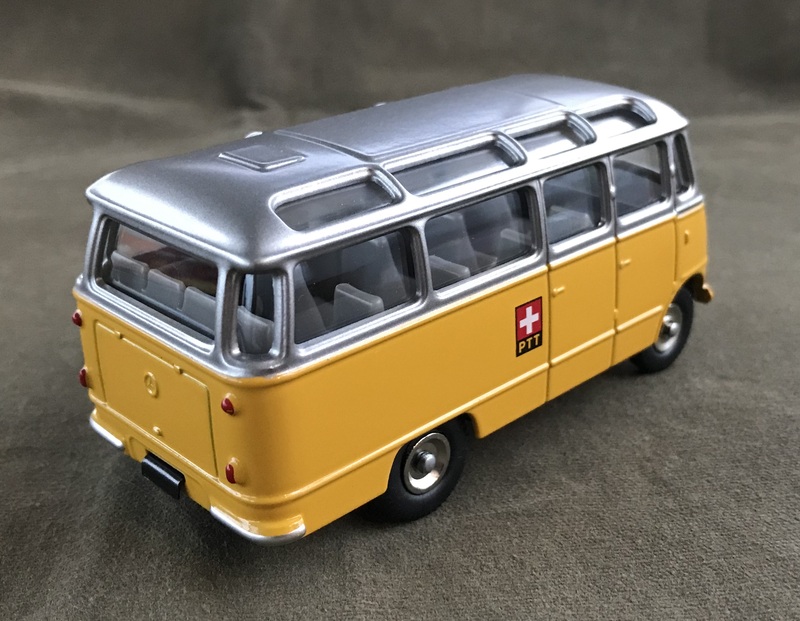 Help validate whether Meccano (France) ever made Dinky 541 in the Swiss PTT livery. 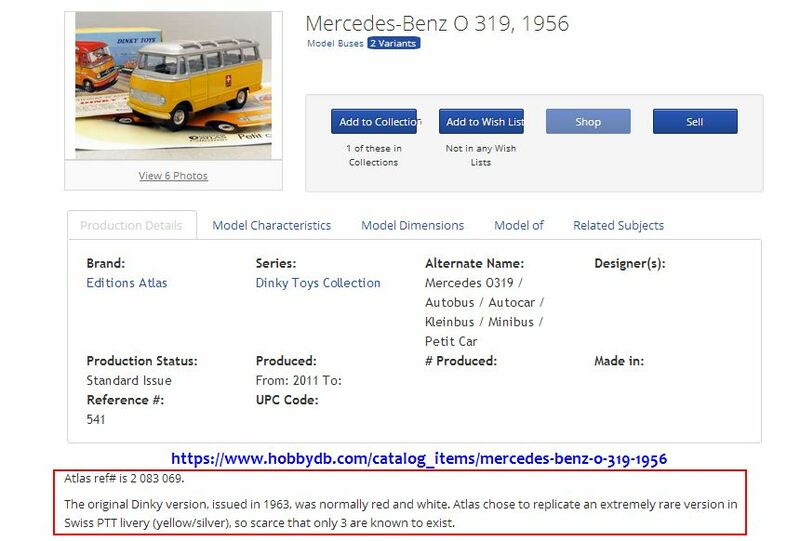 If you have any data, facts, photos, opinions, theories, or other references (books, etc.) 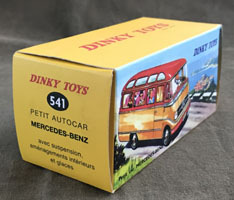 about the existence (and appearance) of an original French Dinky № 541 in this livery, please contact the editor. The Ramsay catalogue lists the "PTT Suisse" variation as a "19??" South African issue. Check out the values of the other South African variations! 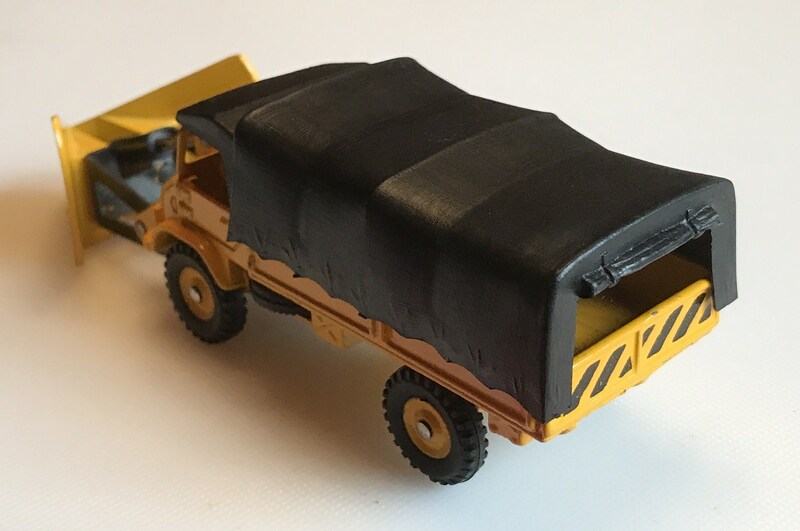 This is a 1:43 scale Type L319D truck with a removable tarp over the cargo bed. The L319D was a speedy forward-control (i.e. 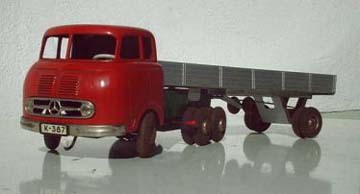 "cab over", no extended engine hood) light duty delivery vehicle, which had a payload of 1.75 tonnes. 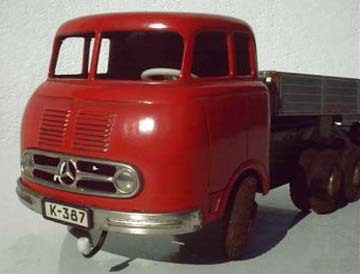 Introduced in 1956, it was part of the second phase of Daimler-Benz postwar truck development. It carried DB through the early 1960s in the light van class and offered either a 68-bhp gasoline engine or a 50-bhp diesel. 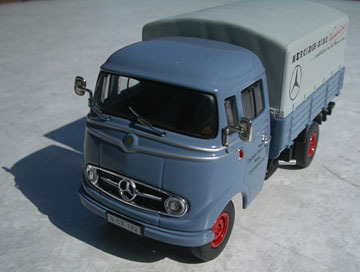 This special blue-grey "Pritsche" (meaning "Pick Up") would have belonged to the "factory fleet" of Daimler-Benz Untertuerkheim during the late 1950s and early 1960s showing the corporate identity of the vehicle. 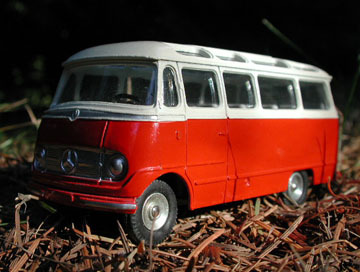 This scale model was still available (as of June 5, 2005) through authorized Mercedes-Benz agents. 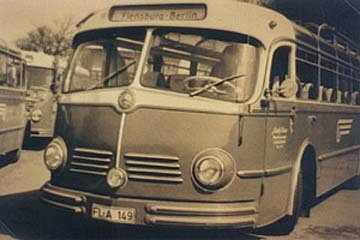 The L319 was produced in Sindelfingen where the passenger vehicles were made. 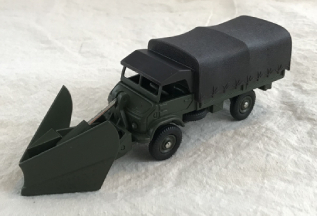 Following an invitation, I had the chance to visit the manufacturing facility of this nice little truck, belonging in Germany to the category of "Eindreivierteltonner": "One and three quarter tons vehicle." It really moved almost like a normal passenger car and had all goodies of our sedans like Kugelumlauflenkung, shifting from the steering wheel, soft connection between engine and chassis (the famous sub-frame or so called, "Fahrschemel"), same steering wheel, same gear shift, almost the same pedals and very good characteristics on the road. A problem: The diesel engines had very little power, yet I never noticed anybody buying a "Benziner" meaning, "gasoline engine." Editor's note: According to Mercedes-Benz Classic magazine (Issue: 2-2004) 6% of the Type 319 trucks were non-diesel. 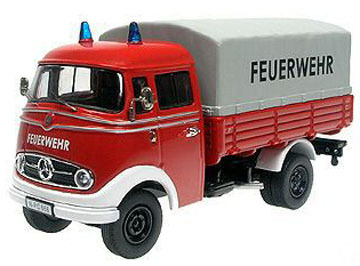 Mercedes-Benz Type L319 Kasten / box van, "fire-brigade." Produced by NZG / Premium ClassiXX at 1:50 scale. NZG № 11054. 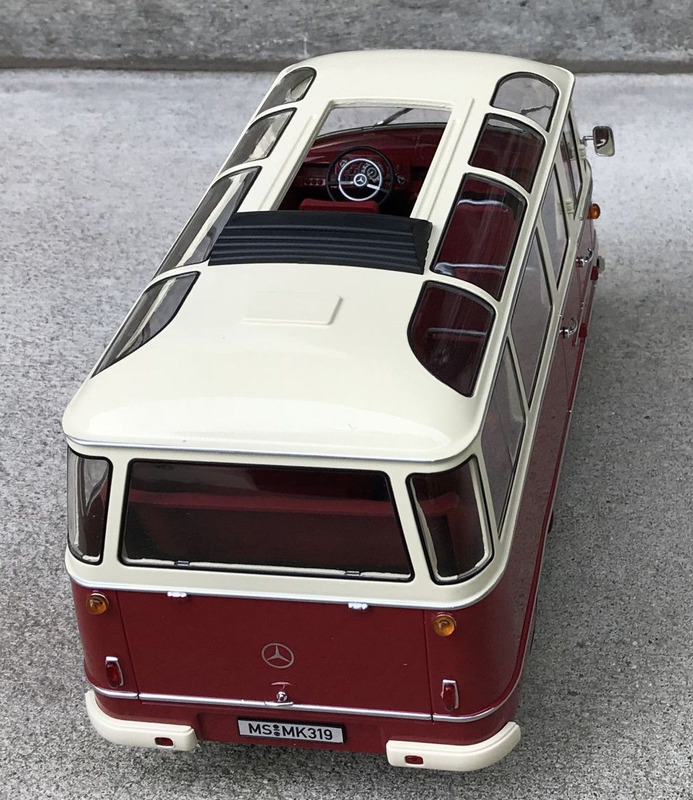 The brilliance of the Daimler-Benz design is seen by comparing this model to the photos of the blue-grey Type L319D "Pritsche" (pick up) provided by Hartwig Mueller. These vehicles were designed on a single platform, which could be called into any number of configurations depending on the customer's wishes. The most significant option came from the catalog of Daimler-Benz engines with a wide range of power outputs. Versatility was the name of the game. 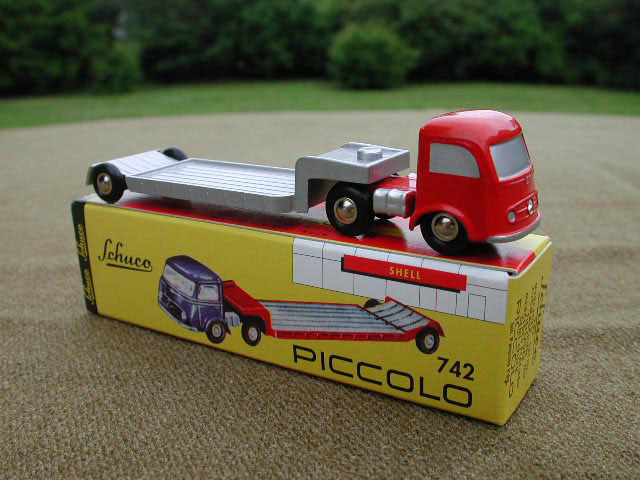 Model number 740 in the Schuco Piccolo (1:90 scale) series. 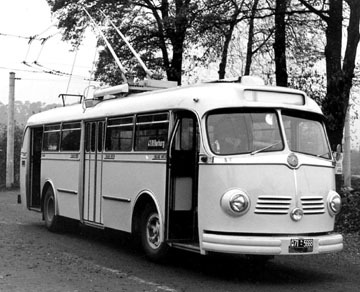 A Ponton era Mercedes-Benz coach. 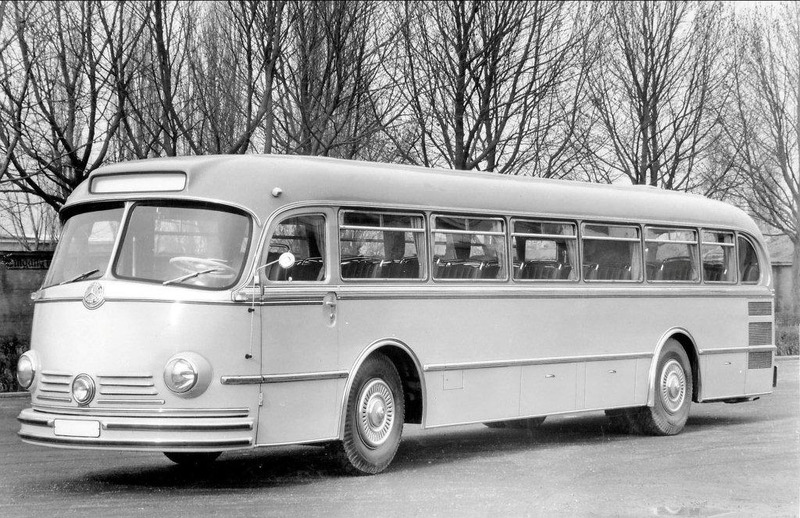 The prototype for this model was the Type O 321H "Omnibus." This particular example is missing the interior seats. 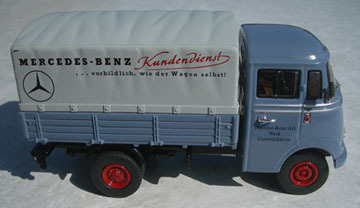 Heras package number 2070 — "Modellstrassenfahrzeuge"
Notice the large three pointed star in the center of the grille on the illustration. 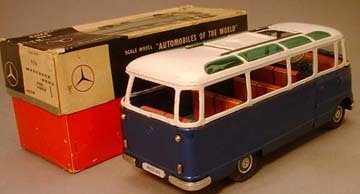 Neither the prototype (Mercedes-Benz Type O 6600 H "Omnibus") or the Heras model includes this detail. This is known as "full artistic control – run amok." Purists typically scorn such blatant deviations from reality! 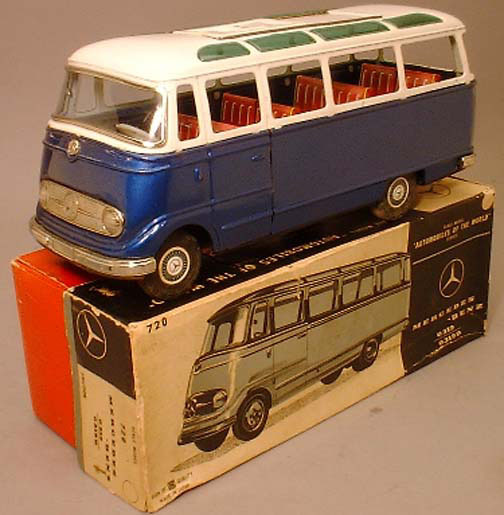 This bus is at the center of the Heras package number 2070 "Modellstrassenfahrzeuge." 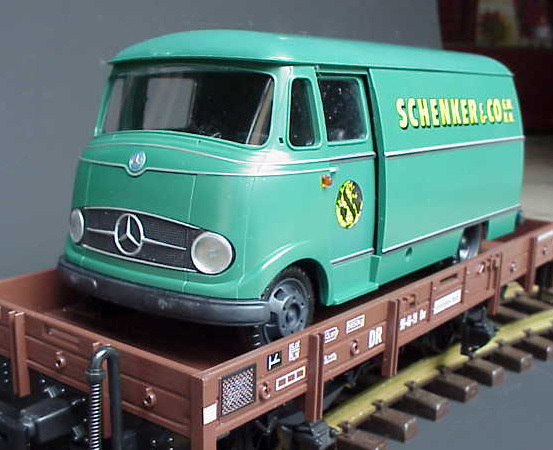 It includes this motorized, 1:87 scale Mercedes-Benz coach and eight sections of track. 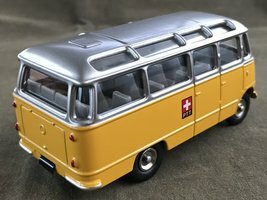 A nice detail is the luggage roof rack at the rear. The base plate reads, "HERAS Made in Germany Nr. 1070." 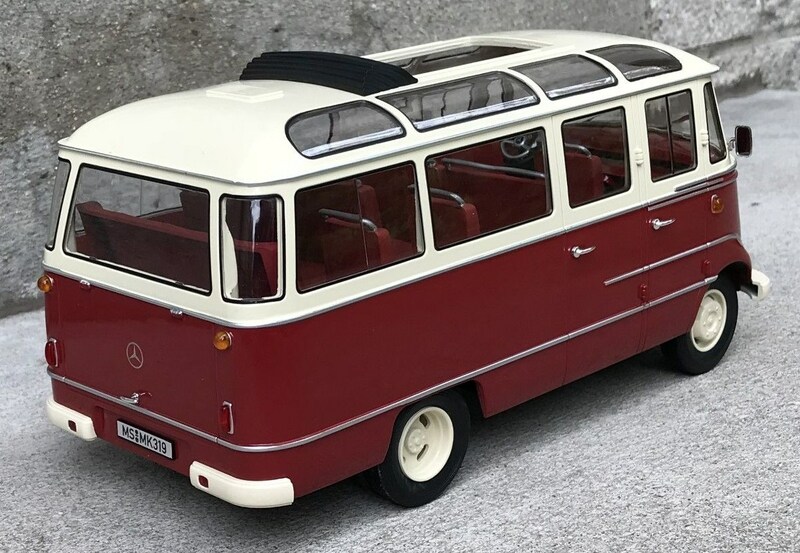 Mercedes-Benz Type O 6600 H "Omnibus"
The HERAS model may have been influenced by the Mercedes-Benz Type O6600H "Omnibus" produced by Daimler-Benz starting in 1951. The center of the grille on the prototype features a single fog light. The traditional, cloisonné style badge with three-pointed star is located higher up, under the windshield. 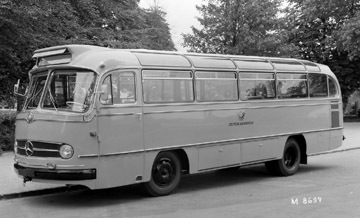 The Mercedes-Benz Type O 6600 H used a pioneering design, which placed the engine in the rear of the bus. This was a more efficient use of space and reduced the noise level in the interior. 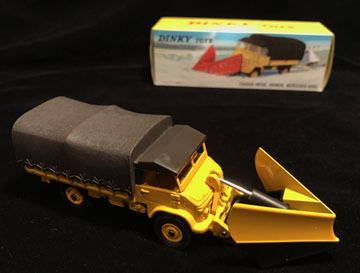 This Matchbox die-cast metal toy was made in 1965 by Lesney, in England. It is number 68, "Mercedes Coach." The turquoise color variation (known as "green" in the Matchbox reference guides) is rare, and boosts the value of this particular model by 10X over the later orange color variation. Approximate scale: 1:64. 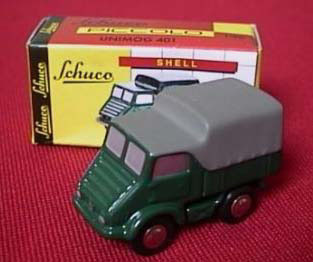 The box alone (illustrating the green Matchbox "Mercedes Coach") can be worth $20-$50 depending on condition, and who is shopping in the market. 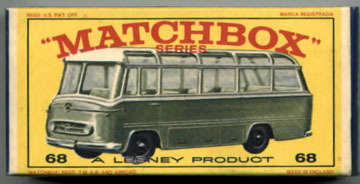 Lesney (England) Matchbox № 68 (of 75) "Mercedes Coach." The orange color variation is common. 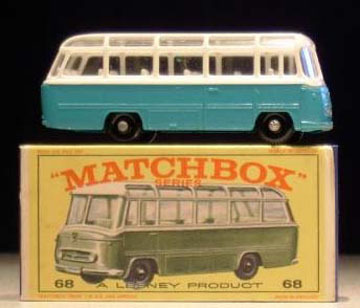 The original Matchbox model (with green paint) was released by Lesney in 1965. 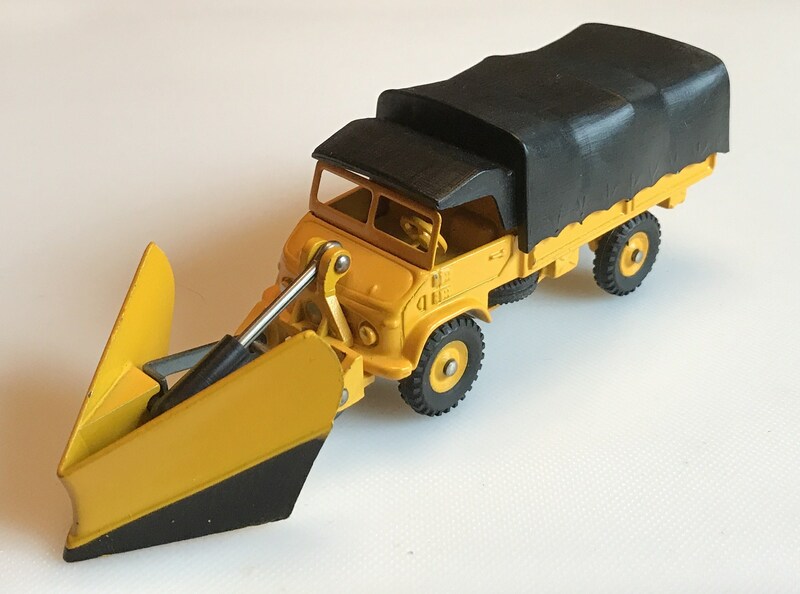 This plastic model from Hong Kong looks like the same model Lesney used as a prototype for Matchbox № 68. 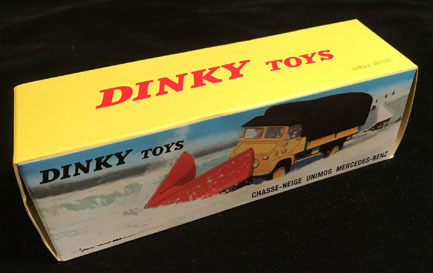 Packaging artwork. This example is from Hong Kong. Mercedes-Benz Type O 321 H "Omnibus"
I believe the prototype for Matchbox № 68 may have been the Mercedes-Benz Type O 321 H "Omnibus." 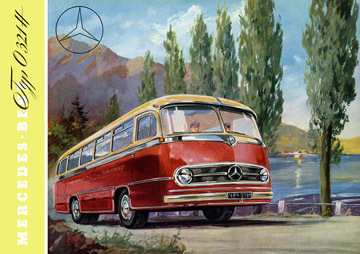 The O 321 H was first produced in 1954 by Daimler-Benz in Mannheim. 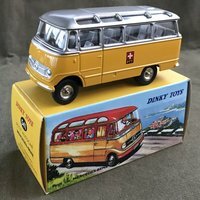 I am not yet 100% certain which full-scale bus the Matchbox model was made to represent, but by 1965, when Lesney first released the Matchbox model, Daimler-Benz was already using a more modern (angular) grille and body design on their buses, such as the Type O 302, which featured rectangular head lights. 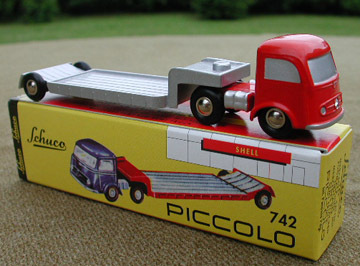 Length of the Matchbox toy is 73 mm. 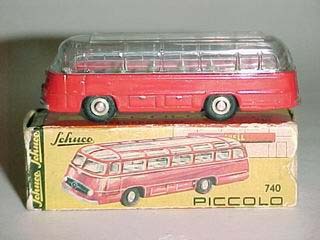 The Type O 321 H bus was 9.2 m. So the scale of the Matchbox is approximately 1:64. From Latin, "Omnibus" can be translated to: "transport for all." 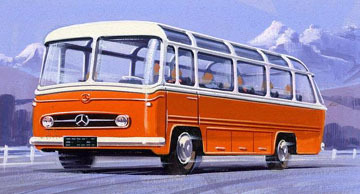 The Type O 321 H (where O = Oelmotor = diesel and H = heck = rear = rear engine) was the first Mercedes-Benz bus to have a self supporting (frameless) body. It also has a rear engine, and hence a flat front. As a result, the interior is more spacious, comfortable and quiet because you are constantly "driving away from" the engine noise. 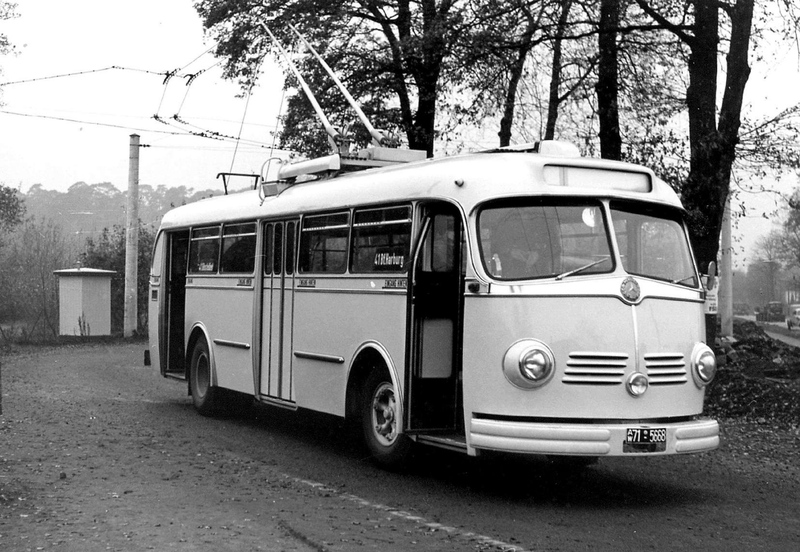 Previously, buses were designed from existing truck platforms, which resulted in a louder, less comfortable ride. The O 321 H was designed from the outset as a comfortable riding coach including a custom suspension, which according to one brochure of the day allowed passengers to read a newspaper while in transit, an activity that would not have been possible with the earlier truck suspensions. 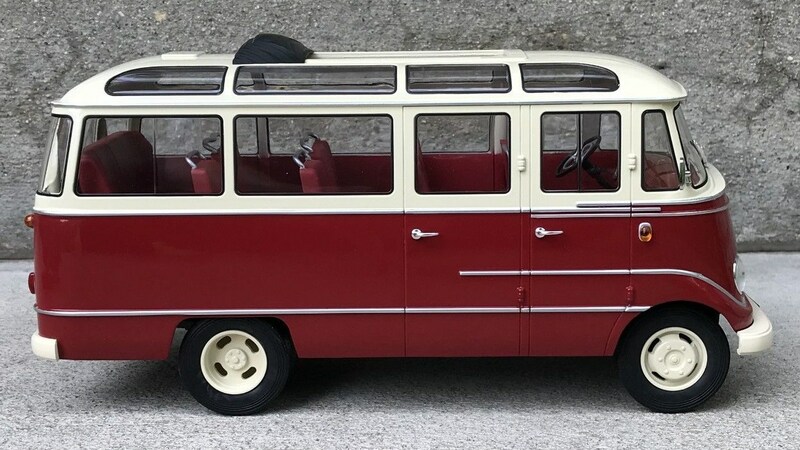 The original O 321 H had a 5.1 liter, 110 hp diesel engine. Engine displacement and power were increased later, but not by much. 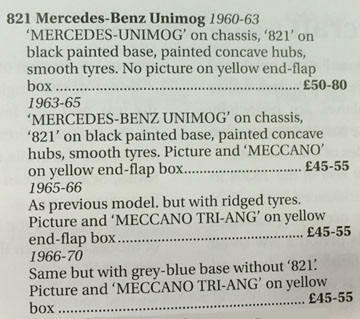 Almost 30,000 units were sold until 1964. 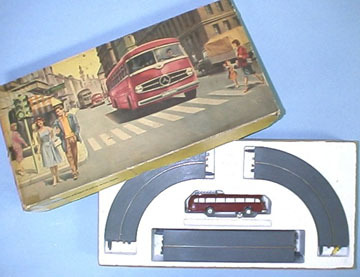 It was very popular in Europe, the Middle East, Africa and South America. 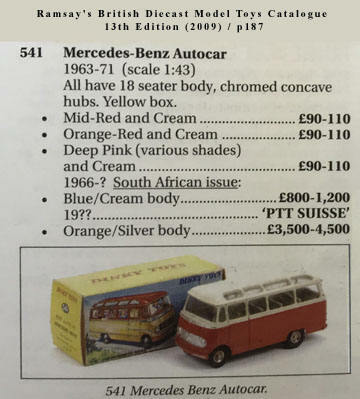 Reference: Mercedes-Benz Classic magazine. Issue: 1-2003. 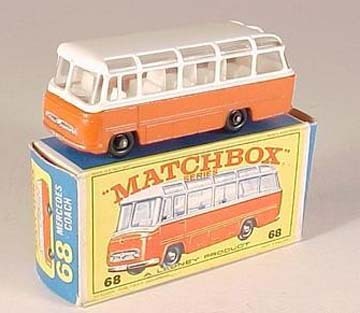 If any readers have more information about which bus model was used as inspiration for the Matchbox #68 "Mercedes Coach", please contact the editor at editor@mbzponton.org. 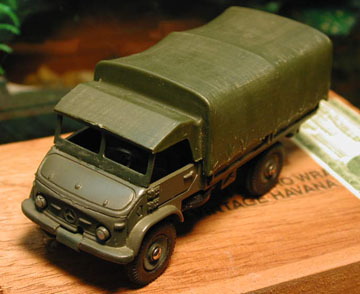 Some examples of this model have a dark green canopy. Daimler-Benz began producing the Type U406 at the Gaggenau truck manufacturing plant in 1963. Corgi (England) № 409, "UNIMOG Tipper." A 1:43 scale die-cast model of a Mercedes-Benz UNIMOG Type U406 "tipper" (dump truck). 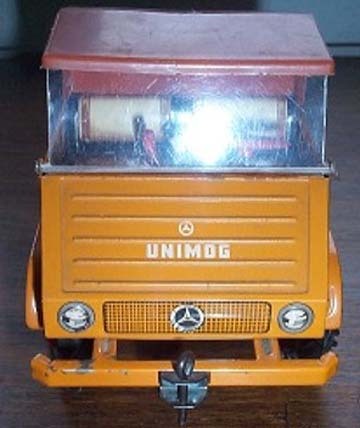 Corgi made this toy from 1971 to 1975 and was modeled after the Type U406, which began production at Daimler-Benz (Gaggenau Works) in 1963. 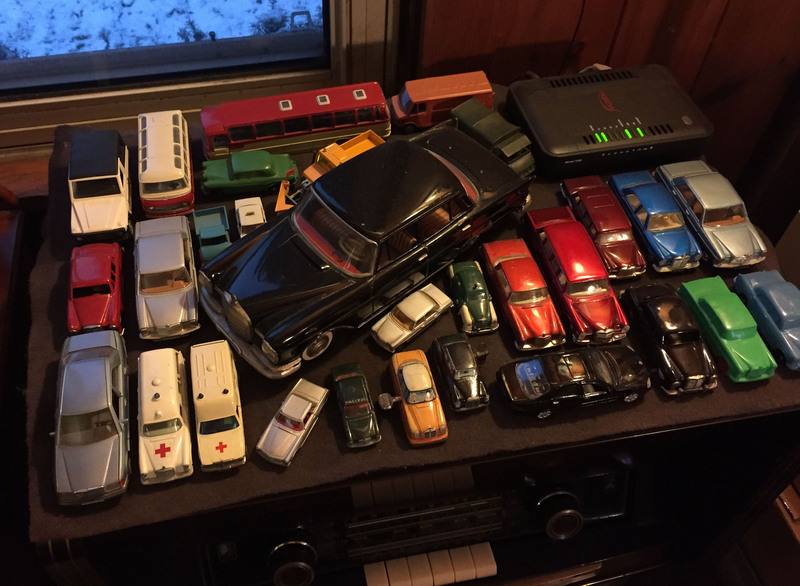 The photo illustrates how a model car collection can "grow on you." Original, pre-modified self-portrait of the editor taken December 1993.